Venice is a city without cars, the last point you can reach driving is Piazzale Roma, crossing “Ponte della Libertà” (Freedom Bridge), where also trains and buses run. Once in Piazzale Roma, or in Stazione Santa Lucia arriving by train, you get to choose how to move: on foot, “vaporetti” (small ferry boats) or taxi. Walking is by far the best way to enjoy and get a real experience of Venice. The small streets are full of surprises, you can find beautiful workshops, shops or restaurants that you would miss by taking a ferry boats. Getting lost is also a wonderful experience. Every corner may hide a lovely glimpse, a beautiful view on the lagoon or a small but amazing church, just to name some examples. 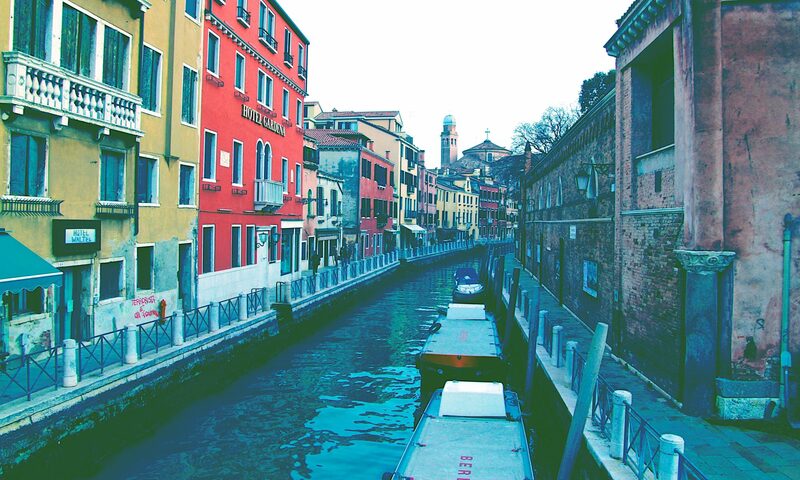 Moreover, Venice is a small city and you can reach every major touristic attraction by walking. City Centre lines (lines 1 and 2) starting from Tronchetto or Piazzale Roma, they reach up to Lido di Venezia using Canal Grande or Canale della Giudecca. City Circle lines (lines 3, 4.1, 4.2, 5.1, 5.2, 6) around the first lagoon perimeter reaching Murano and Lido di Venezia. Lagoon lines (lines 12, 13, 14, 19) connecting the islands of Murano, Torcello, Burano, Sant’Erasmo and S. Servolo, as well as the mainland with connections to Marco Polo airport, Tessera, Treporti, Punta Sabbioni etc. Rolling Venice Discount Card is available for people between the ages of 6 and 29, find out more here. If you want a single ticket, it costs €7,50 for one-way Waterbus Ticket 75’. We are doing our best to keep information updated, in any case make reference to the official site of the municipality. If you are staying longer than a week, evaluate the possibility to subscribe for the public transport card, which allow you to get tickets at reduced fares: venetians use it, but it has higher subscription costs for non-residents. Tip: taking a Vaporetto through Canal Grande and passing under Rialto Bridge is a must for your visit. Boat Taxies are also a choice if you are in Venice. They are the fastest way to move in Venice, but they are expensive. However, it may be the right choice if you are in hurry or if you wish to avoid crowds on Vaporetti. Previous PostPrevious GONDOLA COMB: WHAT DOES IT REPRESENT?